Gain the leading edge! 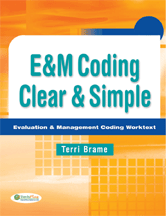 Evaluation and management codes are among the most widely used and most important codes in professional practice. Yet many students struggle with understanding the codes and how to apply them. . . not anymore. This easy-to-read text breaks these complex codes into manageable, bite-sized pieces. Practice questions and real-world case studies help you apply your knowledge and approach any coding situation with confidence. Even more online at DavisPlus (davisplus.fadavis.com). Enhance your skills with engaging, interactive exercises, yearly content updates, and more!